Fossett Circus comes to Rathwood! 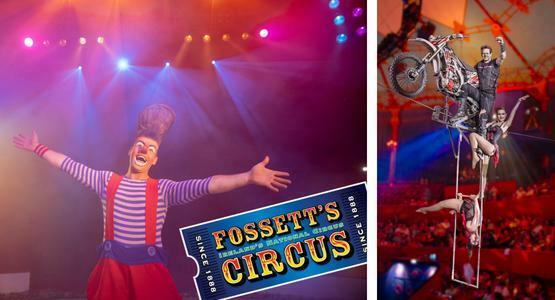 Roll up Roll up the magical world of Fossett's Circus visits Rathwood from Friday 27th of September to October 6th!! Come and join us as we hop on board the Rathwood Circus Train and transported into the Theatre Bigtop with individual seats throughout, and climate controlled for your enjoyment, featuring a host of international Circus stars, breathtaking acts from all over the world in a jam-packed performance you won't forget! Don't miss the Daredevils on the Highwire , John, Sarah and Iowana perform the daring "Motorcycle on the highwire", Jugglers, hula hoop artistry, Wild West presentation,contortionist, trapeze and lots more and not forgetting OTTO the Nations Favourite clown who promises to have lots of fun and laughter up his sleeve for this years show.